Born in Newark-on-Trent in1924; mother- a schoolteacher, father- Chief Librarian and Museum Director of this most historically interesting town.Educated at the Magnus Grammar School, Newark-m-Trent – Nottingham School of Architecture and University of Nottingham. The course of study of architecture was interrupted when he volunteered to join the RAF and qualified as a member of a Lancaster crew serving in Bomber Command. At the conclusion of the war he was in the Middle East and helped with the establishment of the RAF School of Art in Heliopolis which organised courses in a vast selection of arts and crafts from Commercial Art, Painting, Figure Drawing, History of Architecture, Design and Building Construction. Returning to civilian life he resumed studies in Nottingham and upon graduation in 1949 he commenced work with Cecil Howitt and Partners for some years before accepting an invitation to become the architect in charge of The New Town Hall in Kirkcaldy under David Carr of Carr and Howard and subsequently with Carr and Matthew and Lorimer and Matthew with whom he was involved in educational buildings, a swimming pool, private and local authority housing as well as the new Town Hall. An invitation to return to their practice came from Cecil Howitt and Partners and to open an office in Leicester. Eventually this was accepted and shortly afterwards he became a partner and eventually senior partner of the practice. In addition to work in the office he was deeply involved in the Leicestershire and Rutland Society of Architects of which he served on Council and a number of committees. In 1973-75 he was President of the Society and four years later he was elected Chairman of the East Midlands Region of the Royal Institute of British Architects. Shortly afterwards he commenced a total of nine years on the National Council of the R.I.B.A. serving on a number of committees. In 1973 the Leicestershire and Rutland Society of Architects celebrated the centenary of its formation and together with Roger Keene, Lloyd-Smith wrote a book recording the first 100 years of Leicestershire and Rutland Architects. 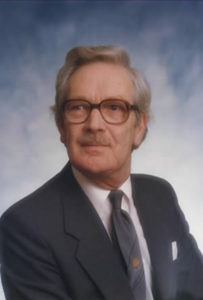 Extra-mural interests resulted in his election in 1974 as a Commissioner of Income Tax and subsequently a member of the Lord Chancellor’s Advisory Committee. In the same year he was appointed a Justice of the Peace all of which appointments he served regularly until he reached the stipulated maximum age. In 2007, to his considerable surprise and delight, he was elected an Hereditary Freeman of the City of Leicester. His interests beyond those already mentioned are sport (rugby in particular), music (lunch time and De Montfort Hall concerts). and he is an avid follower of the Literary and Philosophical Society lectures and activities together with the lectures and visits organised by the Friends of Leicester and Leicestershire Museums. He has a great interest in the church,. particularly the Congregational denomination of which he was a Deacon, including Senior Deacon for a total of 45 years. Presidential Address: “Oh Mistress Mine” (Comments on the History of Architecture) 1985. Transactions of the Leicester Literary and Philosophical Society, Vol. 80 pp.1 – 20.